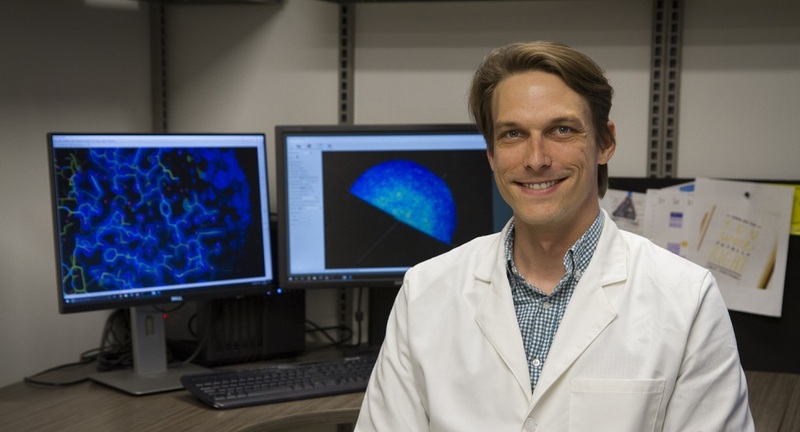 Thomas Moon is a postdoctoral research associate in the Department of Chemistry and Biochemistry whose research involves studying how enzymes function and interact with each other. The Office of Research, Discovery and Innovation caught up with Moon to discuss the inspiration for his work, his ideal dinner party guests, and his advice for budding researchers. Where did you receive your training and how did you come to UA? I received my undergraduate degree in Chemistry from Trinity University in San Antonio, TX in 2006. I went immediately to graduate school at UT Southwestern Medical Center in Dallas, TX and completed my Ph.D. in Molecular Biophysics in 2012. Wanting a slightly different climate and scientific focus, my first postdoctoral appointment was with Dr. Wolfgang Dostmann in the Department of Pharmacology at the University of Vermont in Burlington, VT. In 2016, I accepted a second postdoctoral appointment at Brown University in Providence, RI with Dr. Wolfgang Peti. 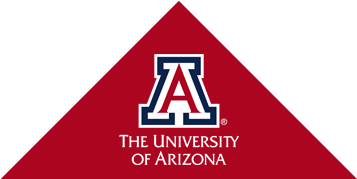 After one year, the laboratory relocated to the University of Arizona in the Department of Chemistry and Biochemistry. What problem do you hope to solve as a researcher, and why do you care about it? There are a number of "problems" that I address indirectly through my research. My work focuses on how signaling complexes form and function at the molecular level in multicellular organisms. The problems that I work on mostly have to do with teasing out the exact mechanisms pertaining to how enzymes function and how they interact with each other. Many people associate biomedical research with diseases. While I don't work on disease states directly, my work – understanding the basic biological and chemical mechanisms at play – can be used to understand how diseased states are different from the normal state and potentially lead to the development of novel treatments. Oh, most of the time I like nothing about the process. It is a painful and, at times, deceitful affair. One often makes incremental progress at great expense and, at times, it is absolutely maddening! That being said, if done well, an experiment will always tell you something. What I do like about research is the moment after all of those terrible and recalcitrant times where it all comes together, and data just seem to fall from the instruments in a torrent. Those are joyous moments, and they make the hardship worthwhile. Both of my parents are educators and, from an early age, I think that I was indoctrinated into academia. All kidding aside, I wanted to be a physician throughout my adolescence. I attended a small liberal arts college for my undergraduate degree, and it was fortuitous that the chemistry department had a well-developed undergraduate research program. I ended up working in two laboratories over the course of three years while pursuing my undergraduate degree. I think from the moment that I performed my first, independent experiment, I was hooked. If you could have a dinner party with three guests of your choosing, dead or alive, who would you invite? My wife, James Baldwin and Kurt Vonnegut. Given the strangely limited parameters, and the liberal use of necromancy, I honestly don't know how a better dinner could be engineered. Maybe the addition of Anthony Bourdain? There are a variety of factors that determine success, but I believe that one of the greatest predictors within one's control would be the ability to break out of one's comfort zone. The big problems in all fields of science require fresh eyes and applying methods and gathering perspectives that have yet to be considered. The ability of students to actively seek out training so that those techniques can be applied to the problem at hand is essential to success. I am an avid tennis player. I play a few times a week with friends and colleagues. I love to ski – although this is not exactly the ideal locale for that. I think the message is, all of the easy things have been accomplished by our forbearers; in science, as well as society. The road ahead is paved with hardship and sacrifice, not for just yourself, but your efforts on behalf of everyone who are living and yet to live within your lifetime. Full acknowledgement of this fact is key to setting your mind to the call of action. The problems we face, small and large, can only be mitigated and ultimately solved through collective action on the behalf of the whole, rather than solely for ourselves. Who is your adviser and how did you meet them? I have worked in the laboratory of Prof. Wolfgang Peti for two and a half years. I met him when I interviewed for a second postdoctoral position in late 2015. He has been very supportive of my career goals and has helped me grow as a scientist and an academic. The time that I have spent in the lab—working on multiple projects—has helped me focus my attention on how to succeed as an academic scientist. I have had a great number of mentors throughout my life. Without their and my family’s support, I would not be where I am. I would say that the mentors who have had the greatest impact on my development as a scientist are my undergraduate faculty mentor and research advisor, Dr. Steven Bachrach, and the Assistant Dean of the Graduate College at UT Southwestern Medical Center, Dr. Stuart Ravnik. Dr. Bachrach holds himself to a high standard and requires those who he trains to also have high standards for ourselves and our work. However, he also has a way of easily transitioning from professorial to conversational that I have always admired. He demonstrated to me that melding the rigors of science with a genuine interest in the people with whom you work is a difficult job, but highly worthwhile and rewarding. Dr. Ravnik saw an undergraduate presentation that I gave at the conclusion of a summer research program and encouraged me to apply to graduate school at UTSW (where I received my PhD). Throughout my time there, he provided a tremendous amount of support and helped me learn to navigate some of the politics that inevitably come with working at any prestigious institution. In particular, there was a time where I considered quitting the graduate program. Dr. Ravnik helped me to gain confidence in myself and my ability to persevere through that very difficult time. Finally, I think that most of the time, mentors train you to be the best professional that they can; but, sometimes, they also help you to become a better human and, I think because of that, a better scientist. Figure out early what the currency of your field is, and be enthusiastic and knowledgeable about the question that you seek to answer. In most cases, as you move along in your training, published manuscripts are the currency – and it never hurts to publish early. This shouldn't be the exclusive priority, though, and it needs to be ever so carefully balanced against the need to ask informed questions that, in turn, generate intelligent hypotheses that will potentially move your chosen field forward. Ultimately, the pairing of these two things (having good ideas and being a part of a body of work that demonstrates your ability to do the work you are proposing) is what makes a successful grant. Well, those things and a lot of good ol' plain, dumb luck.